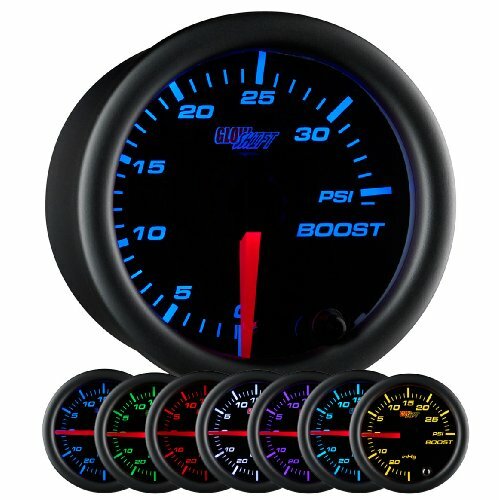 Overview GlowShift's Tinted 7 Color Series Boost/Vacuum Gauge is imperative for anyone that is running a turbo or super charger in their vehicle. This mechanically operated turbo boost gauge will monitor your vehicle's compression and boost levels from -30inHG to 30PSI ensuring that your turbo does not over boost causing major damage to your engine. Gauge Features GlowShift's Boost/Vacuum Gauge features a low profile tinted magnified lens as well as our 7 color through dial LED lighting system. Included with this boost pressure gauge is a t-fitting and 6 feet of silicone vacuum hose allowing you to easily tap any vacuum line that is connected to your intake manifold for an effortless installation. Our through dial LED lighting system allows you to easily select and change the color of the numbers and ticks on your gauge face by simply pressing a button that is located on the front of the gauge. Featuring 7 solid color modes and 2 color cycle modes, this gauge will let you match your factory dash lights or add your own personal style to the interior of your vehicle. With a color memory feature built into each gauge, you won't have to worry about changing the color of the gauge every time you power up your vehicle, and with the new dimmer feature you can connect this gauge to your headlight switch allowing it to dim 30% when your headlights are turned on for better visibility while driving at night. Lifetime Support GlowShift stands behind all of its products by including free lifetime technical support and a one year limited warranty with every gauge purchase. The Bosch SP0F000050 is a Style Line 2" Mechanical Vacuum/Boost Gauge. It features a 0-30 in. Hg Vacuum scale, 0-20 PSI Boost with 270 degree sweep and includes 72" tubing and fittings. The gauge is a standard 2" black dial for 2-1/16" openings and features a black bezel with removable black mounting panel. Includes mounting hardware and 12 volt internal back lighting. The Style Line features a clean easy to read look with a bright pointer against a white or black background. Bosch is known for precision, engineering, and innovation. Add style and you have the first-ever line of Bosch gauges, including replacement tachometers, speedometers, temperature and pressure gauges for all applications. Bosch Branded Gauges represent the latest in design following our 100+ year history of Automotive, Industrial, and Racing products. 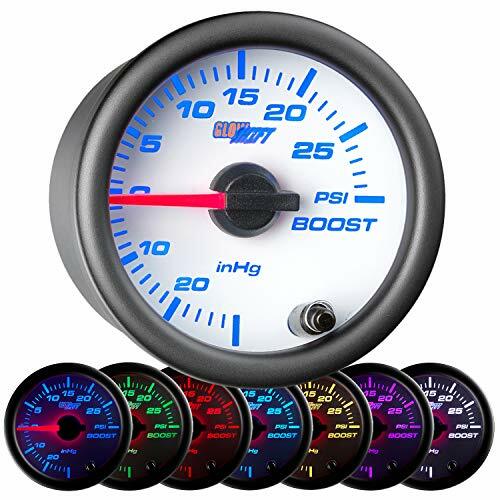 GlowShift s Tinted 7 Color Series 60 PSI Boost Gauge is perfect for any diesel truck that runs high boost pressure, ensuring your turbo is performing at peak levels and does not over boost causing major engine damage. This mechanically driven diesel boost pressure gauge includes a 1/8-27 NPT brass compression fittings with 9' of nylon boost hose, allowing you to drill and tap your intake manifold for extremely accurate gauge readings directly from the source. 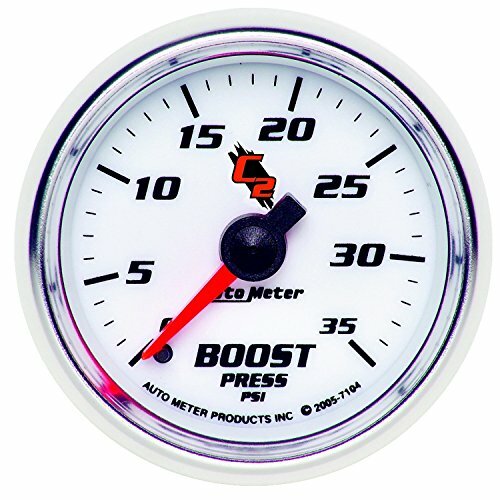 Our 60 PSI boost gauge includes some incredible features like a low profile tinted lens, an illuminated red needle that sweeps 270 degrees for maximum accuracy, 7 color through dial LED lighting, and a dimmer feature that will dim the gauge lighting 30% for easier visibility when driving at night. Our 7 color through dial LED lighting system will allow you to match your factory dash lights or add a distinct style to the interior of your vehicle, and with the color memory recall feature you won t have to worry about resetting the gauge back to your desired color every time you turn your vehicle on. GlowShift stands behind each products by including free lifetime technical support and a one year limited warranty. 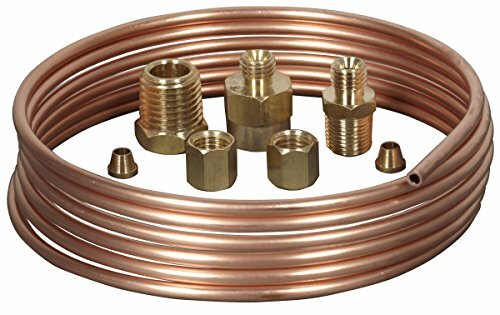 The Bosch SP0F000012 is a Copper Tubing Installation Kit. It is for use with mechanical pressure or mechanical boost gauges and has 1/8" NPT gauge fitting and 1/8" and 1/4" NPT engine fittings. 72" of soft copper tubing. If metric is needed for your application, use adapter kit SP0F000009. Bosch is known for precision, engineering, and innovation. Add style and you have the first-ever line of Bosch gauges, including replacement tachometers, speedometers, temperature and pressure gauges for all applications. Bosch Branded Gauges represent the latest in design following our 100+ year history of Automotive, Industrial, and Racing products. GlowShift's Black 7 Color Series Boost/Vacuum Gauge is imperative for anyone that is running a turbo or super charger in their vehicle. This mechanically operated turbo boost gauge will monitor your vehicles compression and boost levels from -25HG to 30PSI ensuring that your turbo does not over boost causing major damage to your engine. GlowShift's Boost/Vacuum Gauge boasts incredible features like stepper motor technology, a magnified lens that ensures all readings easily monitored, as well as our 7 color through dial LED lighting system. Our through dial LED lighting system allows you to easily select and change the color of the numbers and ticks on your gauge face by simply pressing a button that is located on the front of the gauge. Featuring 7 solid color modes and 2 color cycle modes, this gauge will let you match your factory dash lights or add your own personal style to the interior of your vehicle. With a color memory feature built into each gauge, you won't have to worry about changing the color of the gauge every time you power up your vehicle, and with the new dimmer feature you can connect this gauge to your headlight switch allowing it to dim 30% when your headlights are turned on for better visibility while driving at night. Included with this boost pressure gauge is a t-fitting and 6 feet of silicone vacuum hose allowing you to easily tap any vacuum line that is connected to your intake manifold for an effortless installation. GlowShift stands behind all of its products by including free lifetime technical support and a one year limited warranty with every gauge purchase. 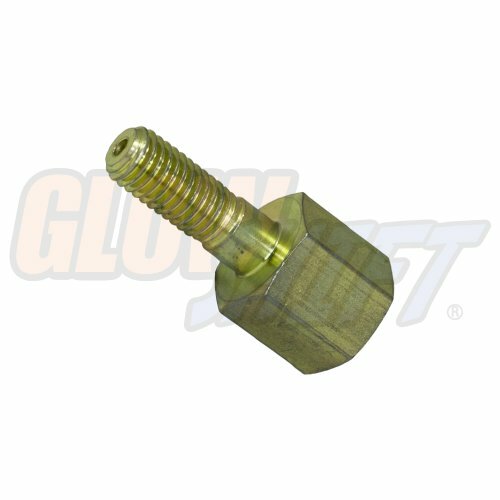 GlowShift's Boost Bolt Adapter is specifically designed to thread directly into your 1998.5-2010 5.9L Dodge Cummins Diesel's intake manifold allowing you to easily install the barbed fitting that is included with your GlowShift boost gauge. GlowShift's Black 7 Color Series 35PSI Boost Gauge lets you to easily monitor your vehicles boost levels, helping you guard against over boosting and causing significant engine damage. This turbo boost gauge is perfect for vehicles running lower boost pressure, and where monitoring vacuum compression levels is not necessary. Installing this boost pressure gauge is a breeze with the included ferrule fitting and vacuum hose that allows you to drill and tap your intake manifold for incredibly accurate readings. 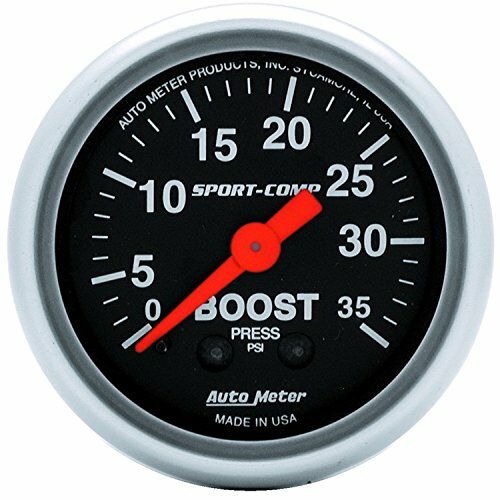 Featuring stepper motor technology, a magnified lens, as well as 7 color LED through dial lighting, this boost gauge gives you everything you are looking for plus a whole lot more. Our 7 color through dial LED lighting system lets the user easily cycle through 7 solid color modes, along with 2 color cycle modes, allowing you to match your factory dash lights or add a custom look to the interior of your vehicle. With the included color memory recall feature you don't need to worry about adjusting the color of your gauge every time you turn your vehicle, and our 7 color gauge series now features a dimmer function that when connected to your headlight switch your gauges will dim 30% for easier monitoring at night. 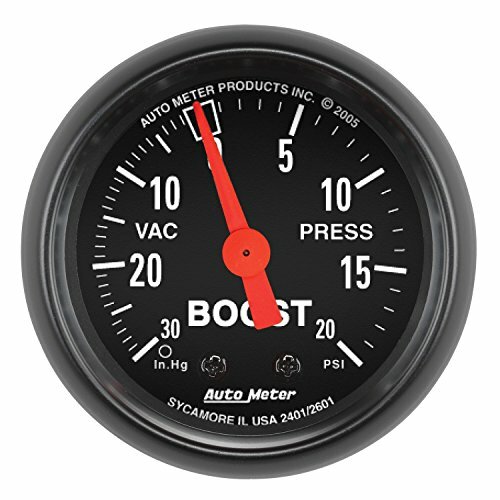 Auto Meter Z-Series 2 inch Mechanical Vacuum/Boost ranges 30 inch Hg/ 20 pounds per square inch. It features bronze bourdon tube 270 degree sweep movements and durable nylon gearing have made these rugged and long lasting gauges a proven high performance favorite for over 25 years. These mechanical gauges require no electrical power for operation making them an ideal choice for vehicles with no or low powered electrical systems. Includes 6 feet tubing. Includes T-fitting. 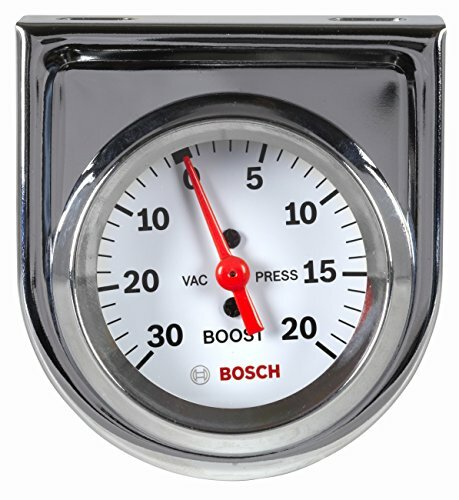 The Bosch SP0F000042 is a Style Line 2" Mechanical Vacuum/Boost Gauge. It features a 0-30 in. Hg Vacuum scale, 0-20 PSI Boost with 270 degree sweep and includes 72" tubing and fittings. The gauge is a standard 2" white dial face for 2-1/16" openings and features a chrome bezel with removable chrome mounting panel. Includes mounting hardware and 12 volt internal back lighting. The Style Line features a clean easy to read look with a bright pointer against a white or black background. Bosch is known for precision, engineering, and innovation. Add style and you have the first-ever line of Bosch gauges, including replacement tachometers, speedometers, temperature and pressure gauges for all applications. Bosch Branded Gauges represent the latest in design following our 100+ year history of Automotive, Industrial, and Racing products. Get more performance out of your Ford 6.0L Power Stroke by plugging in an Electronic Boost Builders inline with the MAP sensor. When the turbo produces a huge volume of boost pressure, the ECM typically sets a trouble code reducing the fueling and the power by 50-80 HP. The Electronic Boost Builder prevents the ECM from seeing the excess boost allowing for turbo to produce the air flow that is being demanded. A prefect match for engines with electronic, injector or turbo enhancements. 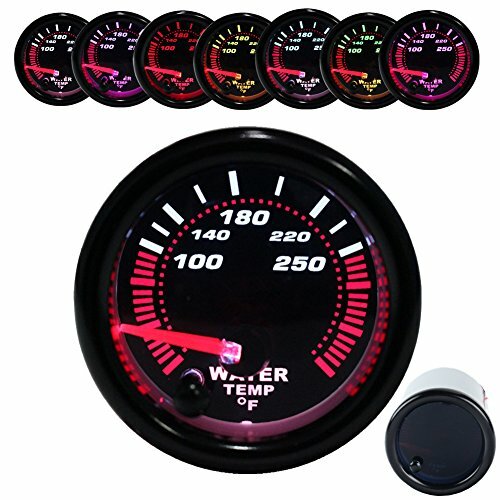 Universal 7-Colors Smoked Style Gauges. We stock 8 different types in this range of gauges. They really look the part with a smoked face when the ignition is switched off, and a bright back-light when the ignition is on. Will this gauge work on my car?A: These gauges are a universal fitment so will work on any 12 volt vehicle (petrol or diesel), some vehicles may require oil filter sandwich plate adaptor to fit the oil pressure and temp senders supplied with related gauges. 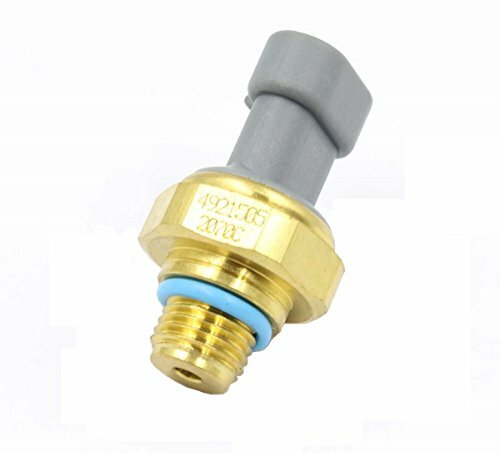 If purchasing a water temp gauge you may also require a water hose adapter if your vehicle does not have an OEM port for the sensor supplied. Do they come with vehicle specific instructions?A: As the gauges are universal they come with instructions specific to the gauge, but not your vehicle. Instructions will state what the wires should be connected to. Are the gauges easy to fit/install?A: As long as you know your way around a car and have basic auto electrical wiring knowledge, then they are easy enough to fit, but we always recommend having the gauges installed and set-up by a professional or Auto electrician. Smoke Lens Black Aluminum Ring Black Face ,Needle Display,Smoked / dark tinted face when the ignition is off. 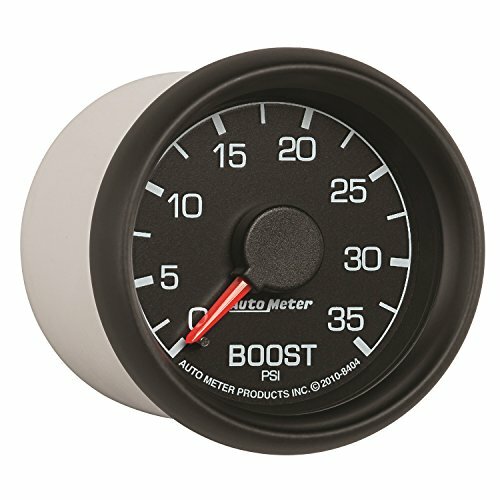 GlowShift's White 7 Color Series Boost/Vacuum Gauge is essential for anyone that has a turbo or super charger installed into their vehicle. This mechanically operated turbo boost gauge will monitor your vehicles compression and boost levels from -25 HG to 30 PSI ensuring that your turbo does not over boost causing major damage to your engine. Included with this boost pressure gauge is a t-fitting and 6 feet of silicone vacuum hose allowing you to easily tap any vacuum line that is connected to your intake manifold for an effortless installation. GlowShift's Boost/Vacuum Gauge boasts some incredible features such as an illuminated red needle, a magnified lens that ensures all readings easily monitored, as well as our 7 color through dial LED lighting system. Our through dial LED lighting system allows you to easily select and change the color of the numbers and ticks on your gauge face by simply pressing a button that is located on the front of the gauge. Featuring 7 solid color modes and 2 color cycle modes, this gauge will let you match your factory dash lights or add your own personal style to the interior of your vehicle. With a color memory feature built into each gauge, you won't have to worry about changing the color of the gauge every time you power up your vehicle, and with the new dimmer feature you can connect this gauge to your headlight switch allowing it to dim 30% when your headlights are turned on for better visibility while driving at night. GlowShift stands behind all of its products by including free lifetime technical support and a one year limited warranty with every gauge purchase. 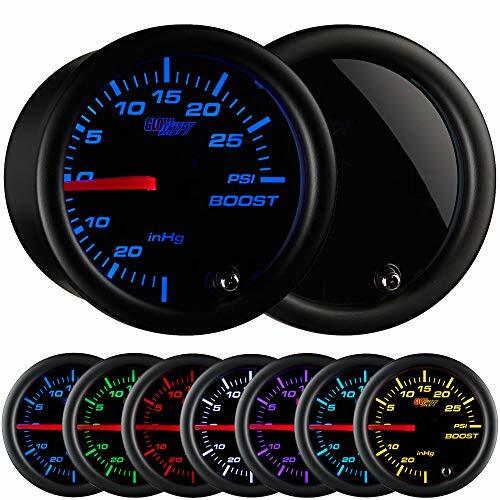 GlowShift s Black 7 Color Series 60 PSI Boost Gauge is perfect for any diesel truck that runs high boost pressure, ensuring your turbo is performing at peak levels and does not over boost causing major engine damage. 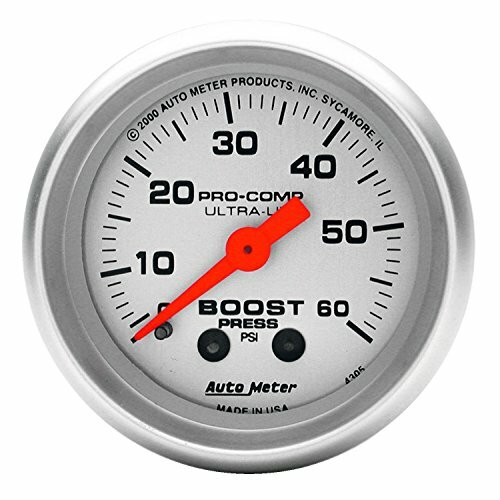 This mechanically driven diesel boost pressure gauge includes a 1/8-27 NPT brass compression fittings with 9' of nylon boost hose, allowing you to drill and tap your intake manifold for extremely accurate gauge readings directly from the source. 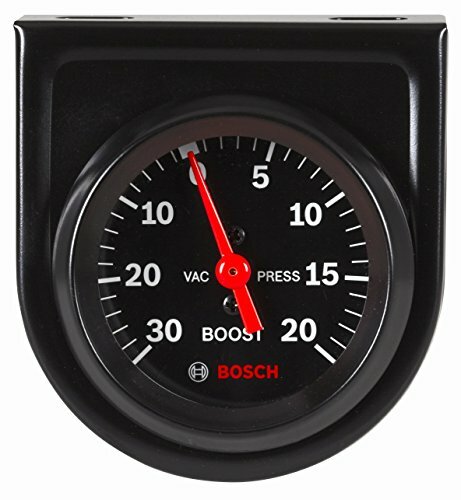 Our 60 PSI boost gauge includes some incredible features like a black gauge face, clear magnified lens, an illuminated red needle that sweeps 270 degrees for maximum accuracy, 7 color through dial LED lighting, and a dimmer feature that will dim the gauge lighting 30% for easier visibility when driving at night. Our 7 color through dial LED lighting system will allow you to match your factory dash lights or add a distinct style to the interior of your vehicle, and with the color memory recall feature you won t have to worry about resetting the gauge back to your desired color every time you turn your vehicle on. GlowShift s White 7 Color Series 60 PSI Boost Gauge is perfect for any diesel truck that runs high boost pressure, ensuring your turbo is performing at peak levels and does not over boost causing major engine damage. This mechanically driven diesel boost pressure gauge includes a 1/8-27 NPT brass compression fittings with 9' of nylon boost hose, allowing you to drill and tap your intake manifold for extremely accurate gauge readings directly from the source. 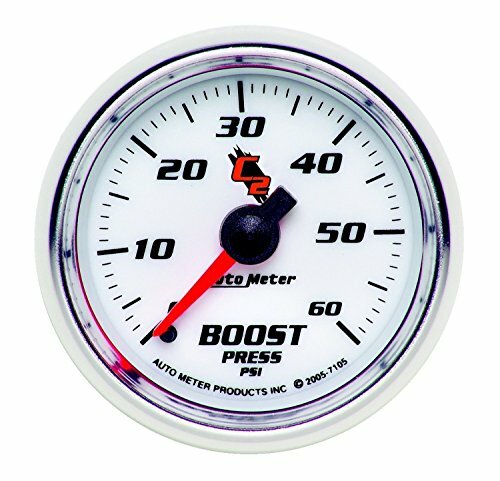 Our 60 PSI boost gauge includes some incredible features like a white gauge face, clear magnified lens, an illuminated red needle that sweeps 270 degrees for maximum accuracy, 7 color through dial LED lighting, and a dimmer feature that will dim the gauge lighting 30% for easier visibility when driving at night. Our 7 color through dial LED lighting system will allow you to match your factory dash lights or add a distinct style to the interior of your vehicle, and with the color memory recall feature you won t have to worry about resetting the gauge back to your desired color every time you turn your vehicle on. The MAP sensor is located in the intake manifold next to cylinder #5. To replace it you simply unplug the wire running to it, unscrew it to remove it, screw the new sensor into the manifold and plug it back in. 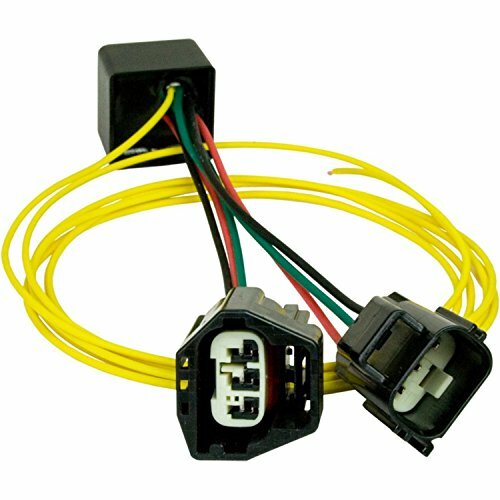 02 trucks require DD1739 MAP Sensor Wiring Harness. Please refer to the OEM part number before you purchase. Cummins MAP Sensor for 01-02 Dodge Turbo Diesel Truck with 5.9L 24V engine. Please make sure your sensor has oval wiring harness connector for proper fitment.